Online giving was up 7.9% in 2016 . Online donations were 7.2% of all fundraising in 2016. Though 7.2% doesn’t represent a massive amount of total giving, it’s well worth the effort to optimize your online channels in order to get the best possible performance out of it. If you get 1,000 visits to your online donation form and 1% convert into donors, you’ll have 10 donors. If you get 1,000 visits to your online donation form and 3% of them convert into donors, you’ll have 30 donors. That’s a 200% improvement! And depending on your average gift amount, this could equate to a significant increase for your organization. Sounds like a worthwhile effort, eh? To help you on your journey to optimize your online donation form, our very own Steve MacLaughlin recently shared some proven and fairly simple tips that you can put into practice today. And it wasn’t just back-of-the-napkin thinking; Steve used findings from Blackbaud’s online giving research as well as research done by Dunham+Company via their Online Fundraising Scorecard. Sit back and take in all the donation form optimization tips. Then let us know which of the 10 you’ll go and implement on your donation form this week! 1) Make it simple for people to find and get to your donation form. Once you have people on your website, it’s important that you draw their attention to your “donate now” button. Take charity: water for example. When you land on their donation page, you fairly quickly notice the big, blue button that says, “donate now”. Tweet this tip: Make sure website visitors can quickly find your “donate now” button! 2) Brand your donation form so that it looks like your website. Building your brand is tough. It takes hard work, strategic thinking, time and persistence – and not to mention, money. Which leads me to wonder … why leave your donation page lightly branded or, even worse, completely unbranded? Branding your donation form not only makes sense, but having a branded donation page builds trust, confidence and increases the likelihood that a person visiting your online donation form will complete a transaction. Tweet this tip: A branded donation page builds trust and increases the likelihood of donors completing a transaction! Check out the New Hampshire Association for the Blind to see a well executed example of this. 3) Make sure potential donors stay on YOUR website—don’t make them click away. If a supporter has to be taken to a 3rd party website to make a donation to your organization, you stand a higher chance of donation form drop-off. People want to know they’re on a secure site when giving a gift and sharing credit card information. Sending supporters away from your site is likely to raise questions and leave supporters wondering if they should rethink giving to your organization online, or at all. Tweet this tip: If potential donors have to leave your website to give, you increase the likelihood of form drop-off! 4) Keep it to one step, not multiple, to make a donation. How many CLICKS does it take to get to the end of a donation form? 65% of organizations surveyed require online donors to click at least three or more times to give a donation. Requiring your donors to take multiple steps in order to give to your organization can cause donation drop-offs. Don’t make it hard for people to give. Tweet this tip: If donors have to click more than once to make a donation, you’re making them work too hard! 5) Keep the number of fields, especially those that are required, to a minimum. People don’t like to give away too much information or spend a lot of time filling out long forms. Be sensitive to this and make sure to limit your donation form to only the fields you truly need. Tweet this tip: Limit your donation form to only the fields you truly need! 6) Ensure that your donation form works on mobile devices. With the increasing use of mobile devices, your organization should be considering how to ensure that donations can be made on the go. If your donation form is not responsive, you’re likely turning away a large pool of potential supporters. In fact, eighty-four percent of organizations surveyed by Dunham+Company have an online donation experience that is not optimized for viewing on a mobile device. Tweet this tip: Giving is mobile. Make sure your online donation form is, too. 7) Offer giving levels and pre-select the one you’d like most donors to choose. Research has shown that suggesting gift amounts leads to improved donation form performance by increasing average online gift size. It’s a simple concept, really. Instead of asking people to type in the amount they want to donate, give them options. The goal is to get people to give larger amounts than they would if left to make their own, unaided decision. Tweet this tip: Suggesting gift amounts leads to improved donation form performance. 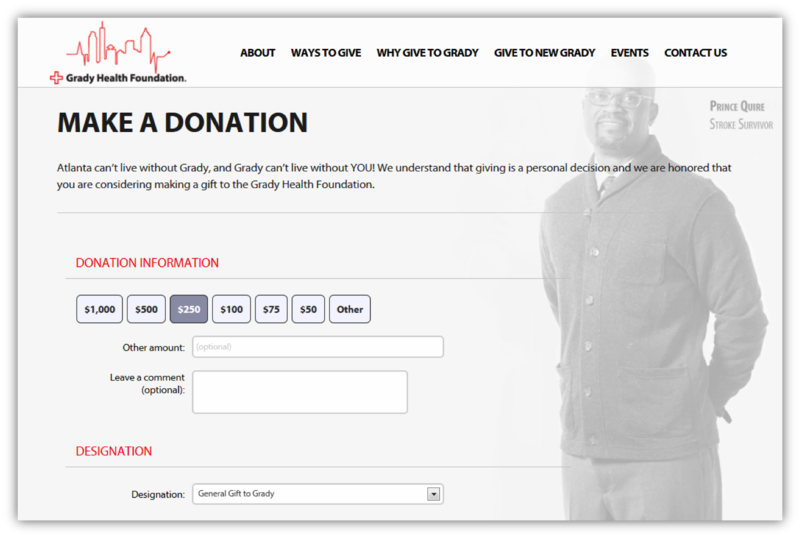 The Grady Health Foundation executes this best-practice flawlessly. Getting a one-time gift is great, especially if that gift is a big one. But receiving a monthly recurring gift, even if for a smaller original amount, is so much better because it means long-term commitment. Make sure you make it simple for your new donors to turn their gift into a monthly recurring donation. Tweet this tip: Set donors up for long-term commitment by offering monthly giving on your donation form. You can’t improve if you don’t know how you’re currently performing. Make sure that you’re carefully monitoring giving habits so that you’re able to cater your plans to the preferences and expectations of your donors. Tweet this tip: Monitor your supporters’ giving habits online to better cater to their preferences. 10) Plan for what happens “after the donation”. You’ve got a great opportunity immediately after someone makes an online donation. They’ve made a decision to invest in you and they’ve pulled out their wallet to do so. This is the emotional high point for the donor, yet most groups are doing little to give donors that warm and fuzzy feeling at the end of the donation process. In fact, nearly two-thirds of organizations surveyed by Dunham+Company did not have any type of next step for a donor to take! There are a two key ways you can take advantage of this moment: 1) The confirmation page and 2) The confirmation email. Be sure to think strategically about how to leverage these post donation “touches” to further the relationship with these new donors: Let them know how their donation will be used. Invite them to join your next event. Share information about volunteer opportunities. Ask them share with their friends on social media why they supported your organization. Looking for more tips to improve your donation form and donor cultivation process? Check out 15 Techniques Used by Top Nonprofits to Boost Donor Acquisition and Online Fundraising Results. This blog post has been updated to reflect the most recent charitable giving statistics. Great post. Your timing could not be better as our nonprofit is in the inception/planning phase. Understanding the importance of cutting a donation form that has heavy conversion returns, what is the best way to go about determining the donation increments I put in place? Thank you Frank, great column. One question is how to determine what giving levels to offer on our giving form. Is there a formula such as make the lowest level $10 lower than your average gift, are people most likely to choose the second level, etc? Most of the larger gifts come in via check or at fundraising event. I would be interested in any suggestions you have.